Embracing an extraordinary gemstone for our sculptural pendants is an inspiring and rewarding endeavor. Pendants by nature highlight a gemstone natural aesthetics. To craft a pendant that has innovative design, while still maintaining synergy with the gemstone, is part of the integrity and quality of the process we value. 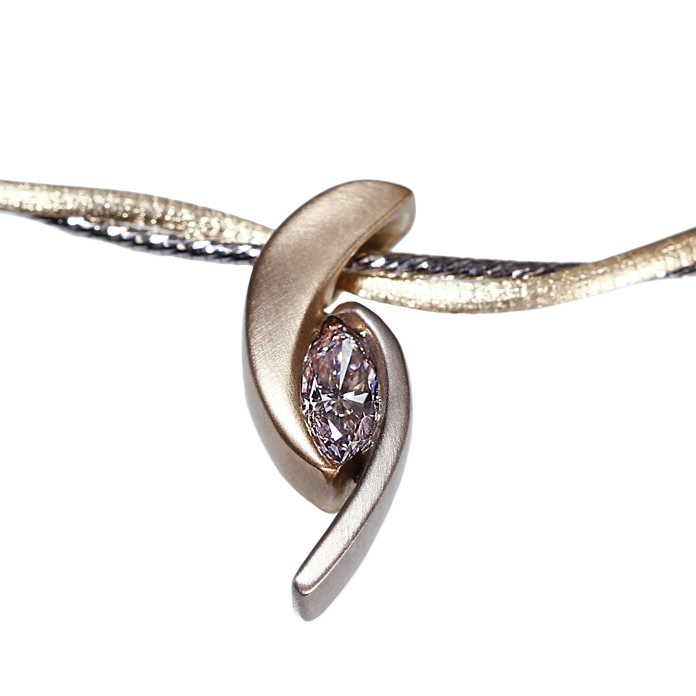 “Diamond Caress II” pendant — Round brilliant cut Diamond, .27cts, set in 18k rose gold. 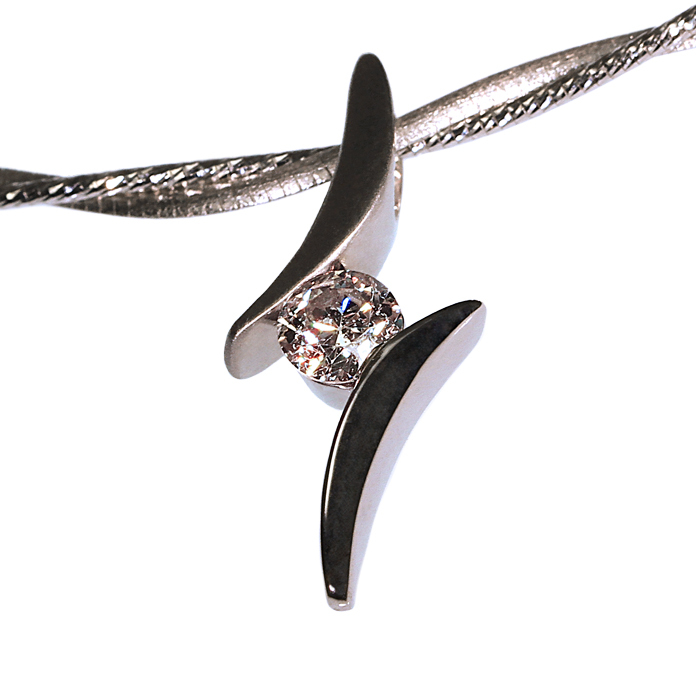 “Caress III” ladies pendant — Round cut Diamond, .26cts, set in 14k white gold. 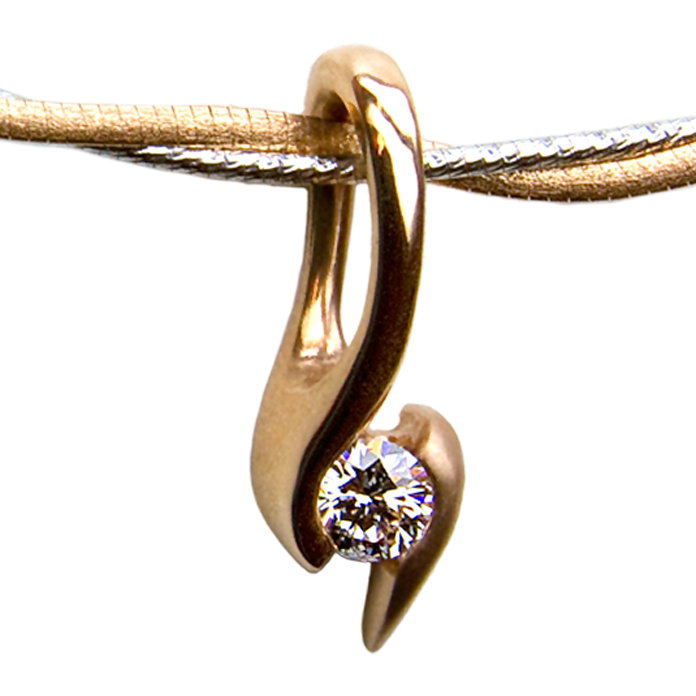 “Caress III” pendant — Round brilliant cut Diamond, .28cts, set in 14k rose gold. 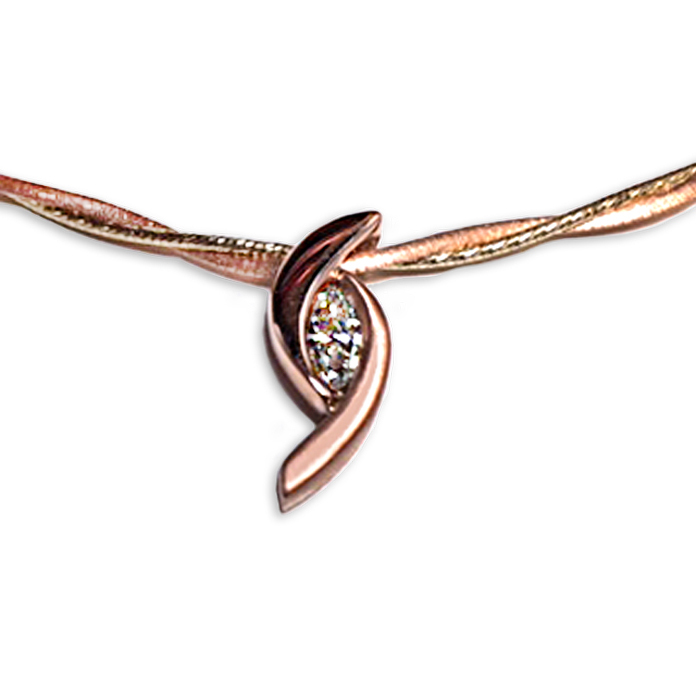 “Rose Whirlpool” ladies pendant — Marquise Diamond, .39cts, set in 14k rose gold. Shown on an Italian Twisted Omega, 14k rose gold. Available in 17”, 18” and 20” lengths. “Golden Fancy” pendant – Fancy yellow Trielle cut Diamond, .24cts, set in 18k yellow gold. “Twins” ladies pendant — Two matched Rainbow Drusy pieces, 16x12x3.5mm, set in fine silver. Shown on a rhodium plated sterling silver spring necklace. 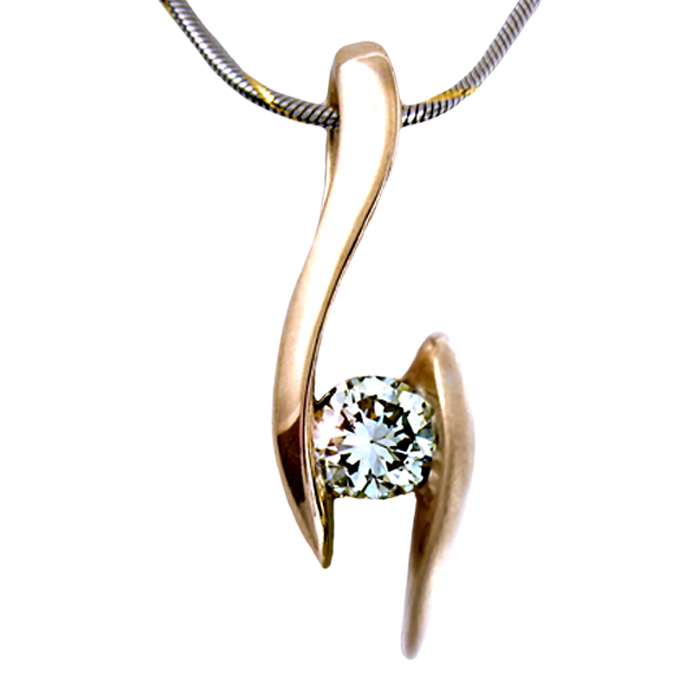 “Lady Finger“ ladies pendant, Round Brilliant Diamond, .57cts, set in 14k white gold. “Shades of Purple” slide pendant – Modified diamond cut Ametrine, 17.17 cts, set in 14k yellow gold. “Marquis Crescent” ladies pendant, Marquis cut Daimond, .52cts, set in 14k yellow & white gold. 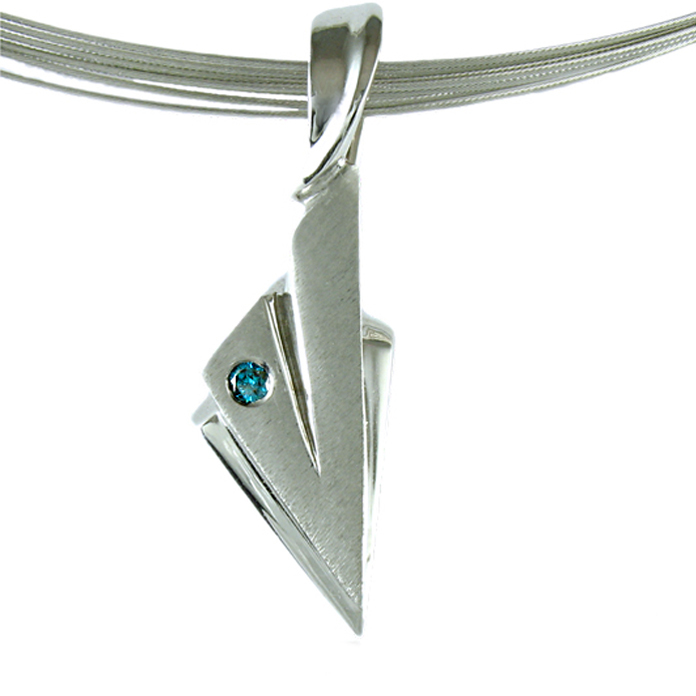 “Diamond Arrow” slide pendant – Color enhanced blue brilliant cut Diamond, .05cts, set in 14k white gold. “Double Bail” ladies pendant, Princess cut diamond, .25cts, set in 14 k yellow gold. “Ruby Caress II” — Oval cut Burmese Ruby, .42cts, set in 18k yellow gold. 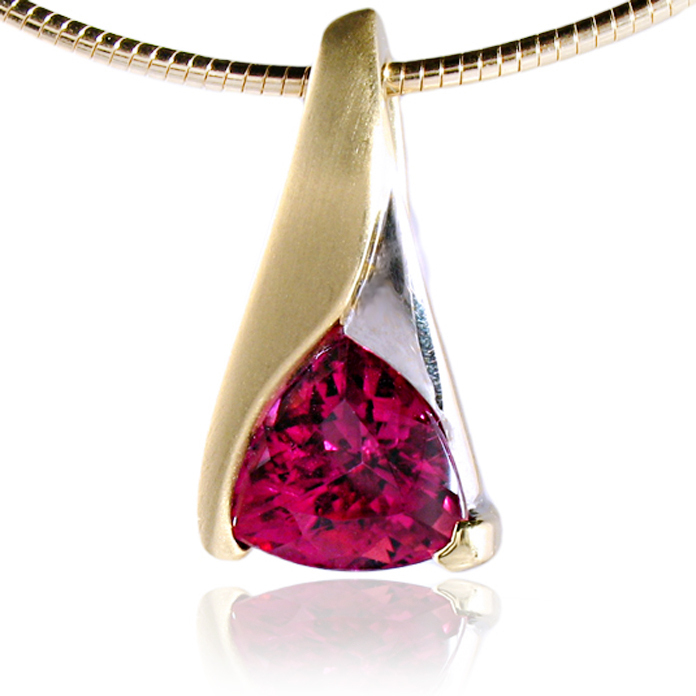 “Pink Blaze” slide pendant – Trillion cut Pink Tourmaline, 3.72cts, set in 18k yellow gold with rhodium. 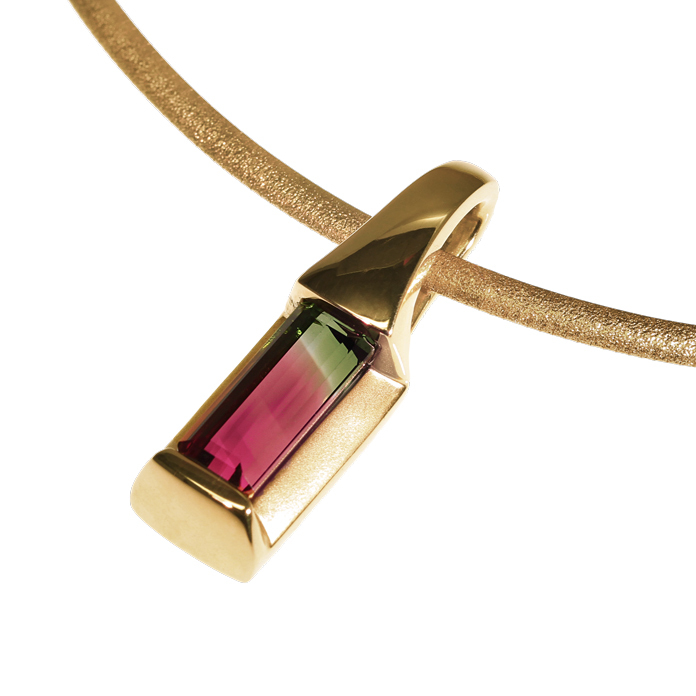 “Bi-Color Suspension” ladies slide pendant, Bi-Color Tourmaline, 6.68cts, set in 18k yellow gold. 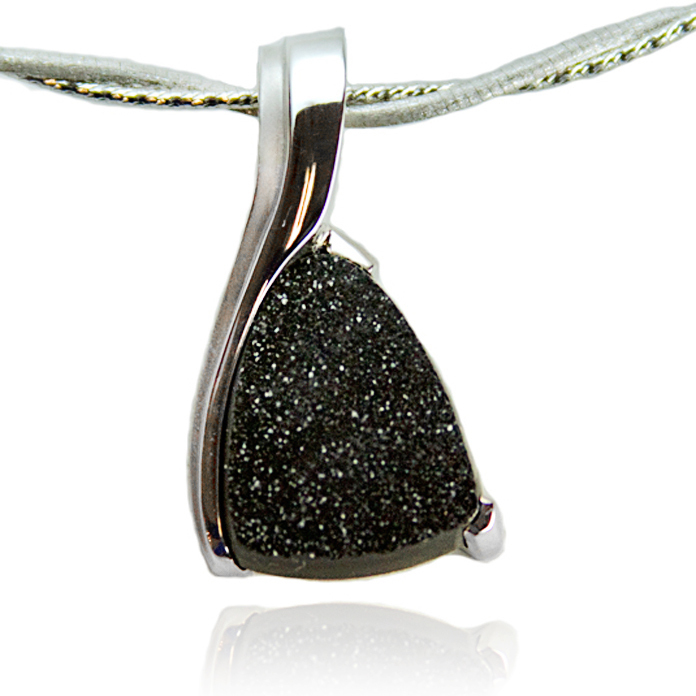 “Onyx Black” slide pendant — Hand-cut Black Drusy Onyx, 18x14mm, set in 14k white gold. 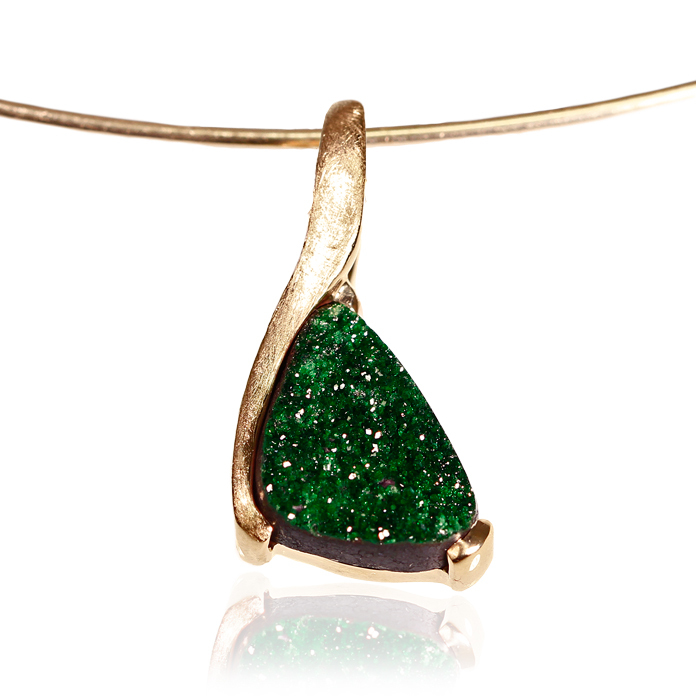 “Petite Green“ ladies slide pendant, Uvarovite Drusy, 13x9x3.5mm, set in 14k yellow gold. 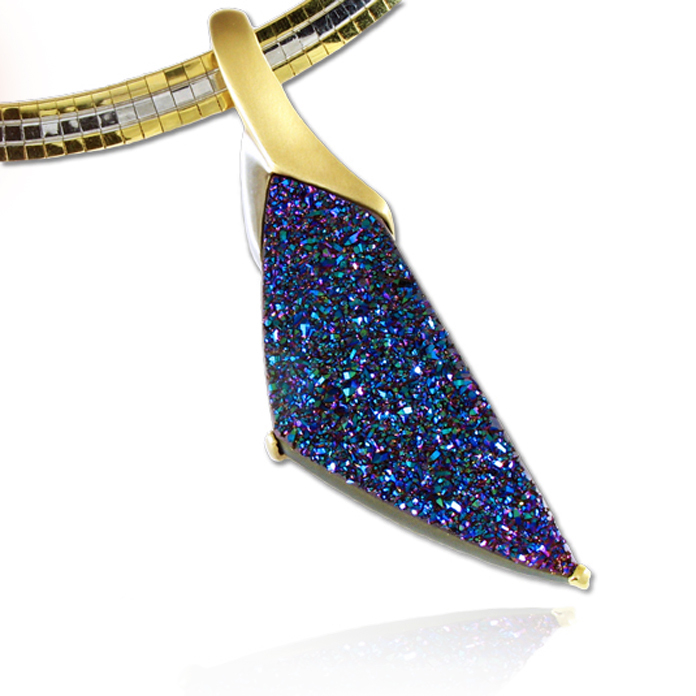 “Rainbow Freedom” slide pendant – Hand-cut Rainbow Drusy, 31.80cts, set in14k yellow gold/Rhodium accent. 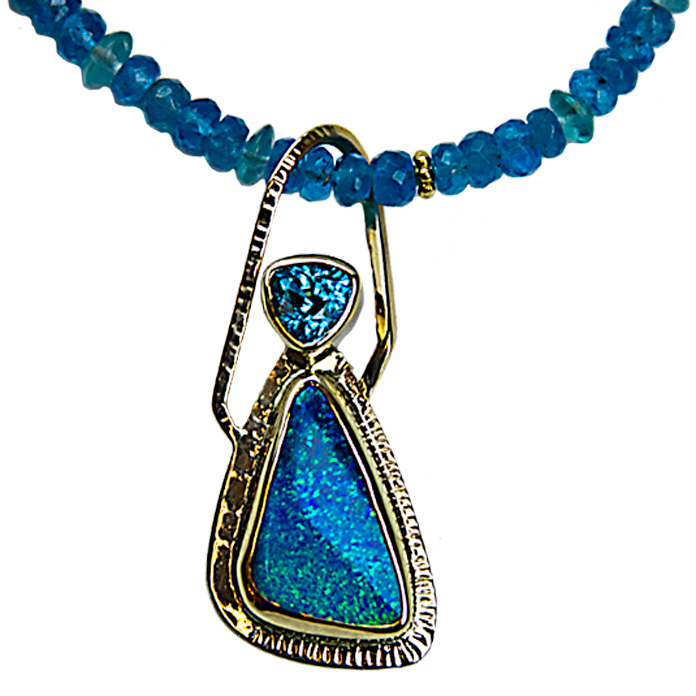 “Exotic” slide pendant — Australian Boulder Opal, 28x15x22mm and Trillion cut Blue Zircon, 1.39cts. Set in 22k and 14k yellow gold. 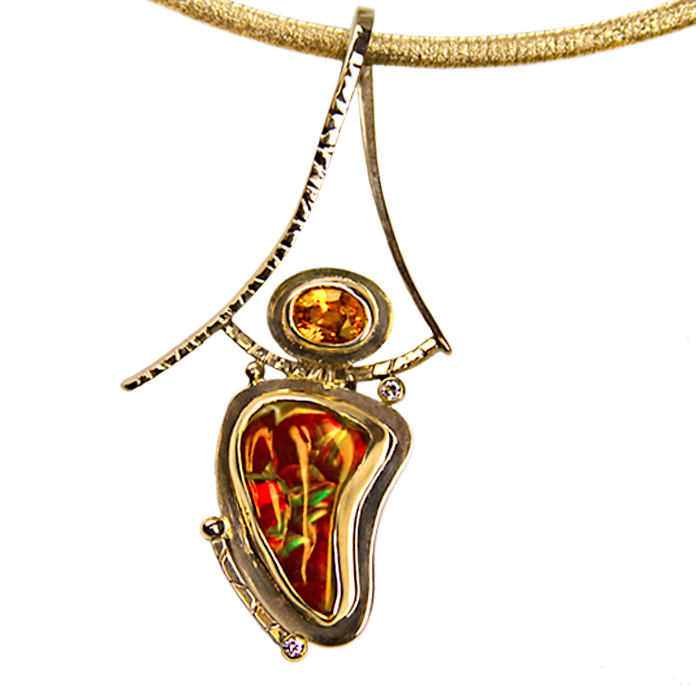 “Autumn Sun” slide pendant — Fire Agate, 10.4cts, with Spessertite Garnet, 1.44cts, set in 18k and 14k yellow gold, two accent Diamonds, .04cts. “Lavender Suite” ladies pendant — Australian Boulder Opal, Lilac Sapphire, 1.08cts, and Amethyst, 6.42cts, set in 22k and 14k yellow gold. Shown on 14k yellow gold, 4mm Classic Convex Omega, 18” in length.